Tradition. It's all about tradition. 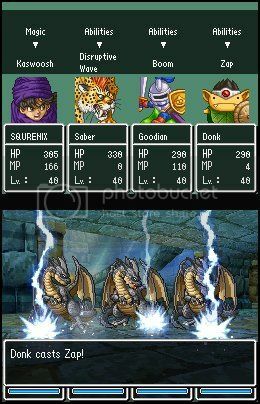 The Dragon Quest series exemplifies video game tradition above all else, and the fifth game in the series carries this concept forward in all major aspects of game design (even if it's a DS remake coming out 17 years after the original Super Famicom release). The Dragon Quest series (and its spin-offs, no less!) have become an important part of the extensive library of quality DS RPGs. 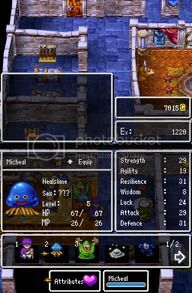 DQ V originally released in Japan for the Super Famicom (1992) (then later remade for the PS2, Japan only, in 2004); Square Enix released this DS remake in 2009 outside Japan. 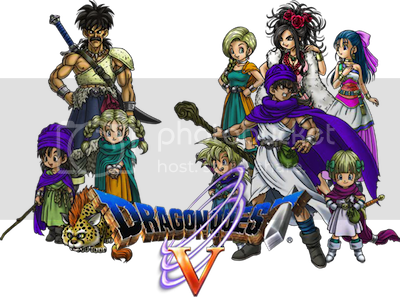 More than anything, the allure of Dragon Quest V is its wonderfully told story. This game steps the player through the main hero's lifetime, starting out with his birth, leading up to his childhood and seeing him grow up alongside his father. Without spoiling the story, the hero encounters great difficulties, tragedies, and much more. The hero, of course, is a silent protagonist. The story is actually related, in a way, to the previous DQ game, Chapters of the Chosen (with 'Zenithia' being the central theme that I won't go into details here). Just note that DQ IV, V, and VI are famously known for being a trilogy, and playing through IV and then V, I enjoyed seeing the connection there. The hero starts off as a young boy, dressed in his purple garments. It's the latest fashion of course! 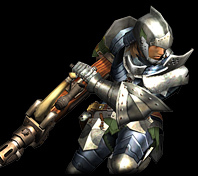 The battle mechanics remain largely unchanged from Chapters of the Chosen, though the biggest addition is the ability to recruit certain enemy monsters after you battle them. This feature allows for some fun team customization and adds a personalized touch to the game due to the large variety of monsters you will end up being able to choose from. It's interesting to note that this concept was in place before Pokemon released, so no, Dragon Quest did not rip-off the Pokemon craze! Let's take a look at my Healslime, is he a monster... I can count on?? Other than some of the new additions, you will find the standard turn-based battle mechanics haven't changed, for better or worse. The simplest of battles will have you pressing a single button in rapid succession as you choose 'attack' over and over again, but the game, of course, won't let you get away with this kind of mindless enemy bashing all the time. As you progress through the game, strategy becomes a lot more important, as well as understanding what's most effective against your enemy. Your standard attributes like HP and MP still apply, and you'll have to rely on herbs or healing spells when HP starts getting low. You'll need to travel back to towns to resurrect dead party members (later in the game this is no longer an issue) or to save at the church (which requires scrolling through the same text every time). A little annoying sometimes, but nothing that really made the game worse for me. I grew up playing these kinds of games! Choose your action, young hero! This is old-school RPG goodness through and through, especially evident in character conversations and 'cut-scenes.' There are no floating portrait faces during conversations, no rendered videos, no camera close-ups during critical moments. No matter the event, the view and the graphics remain the same (there are a few notable exceptions). Even during important story events, the only additional graphical feature is a conversation box at the bottom of the main screen, and the characters will move on their own according to the story script. Personalization is the strength of the game: not only can you recruit and set up your monsters, you also make some personal decisions during the game that affect the story in different ways (most famously the ability to choose your wife). There's not an overwhelming number of decisions to make, therefore reducing some of the stress on the player: DQ V has just enough to keep it simple yet keep the player completely engaged and emotionally connected to the characters due to the player's involvement. Like Dragon Quest games before it, this one features very pleasant music compositions. While you will find some of the recurring themes heard in its predecessors, many of the new tracks sound better than ever, like Overworld Theme, Town, and Castle. 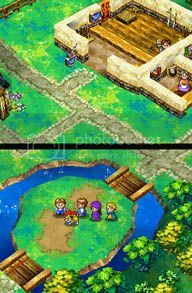 The graphics are at about the same quality as DQ IV, which means they're very good! Enemy sprites are well animated and full of personality during battles, especially with their attack sequences. 3D polygonal towns and buildings look great especially when you rotate the camera in complete circles (quite smoothly I must say). Something I didn't mention in my DQ IV review but thought I'd point out now is I really like the art style, famously done by the Dragon Ball artist Akira Toriyama. Of course, it's all a personal preference, but there's something whimsical and appealing about the character design, especially the monsters! 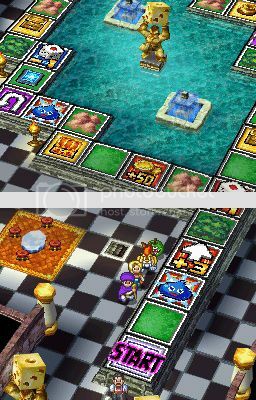 The DQ games definitely seem to have a certain charm to them, part of it being they have a serious story but with humor and an upbeat attitude. Conversations can be funny at times (like when talking to your monster party members, though the puns are sometimes a bit forced, especially the goo and the slime stuff). The Rotten Apple may tell you, "No, I don't taste good." You will usually get clues and hints on where to go next by talking to people and listening to the rumors. Many times it's blatantly obvious where you have to go, and game progression is fairly linear (also due to the fact that you're limited on where you can travel some of the time). But then, just like in DQ IV, you reach a point where the world opens up quite a bit and you have more options on where to go next or how soon you want to continue the main quest. These moments can be frustrating when it's not entirely clear where to go (I found that getting lost in an open world was less of an issue with this game compared to DQ IV, so that's an improvement!). As in DQ IV, you can explore every crevice and break every pot to find hidden items. (It's funny how these RPGs always have these heroes whose thievery is inexplicably acceptable among the town's citizens, or perhaps they simply get away with their crimes?). Returning also are some fun little diversions like the casino so you can gamble away your fortunes at the arena (if gambling is your cup of tea), and new additions like betting on the slime races. There are also board games called T n T that are based on rolling the die in the hopes of winning some great prizes. The game's length feels right (my first playthrough was about 37 hours) and overall made for an enjoyable and challenging experience. (It's also worth noting there is even more to do after finishing the main game!) The challenge really kicks in in the later parts of the game, where every decision you make in battle is crucial. One wrong move, and it's over. Add to the fact that most of the major bosses have no save points or heal rooms just outside their room like some modern RPGs have implemented (today's gamers are spoiled, haha), you will be very grateful to find out you keep all your experience points after being wiped out. I look forward to playing Dragon Quest VI: Realms of Revelation!